There are many models for designing courses and most contain the following elements: consideration of situational factors; identification of learning goals; construction of evaluation activities and feedback; construction of learning activities. The following two course design approaches provide a good starting place for course design. what is worthy of learning? what evidence do students need to produce in order to demonstrate their progress? how will progress be assessed and by whom (self, peers, instructor, TAs)? how will I structure the learning environment to support their learning? Determining the essential learning at the heart of the course will help you guide your students toward some achievable goals. Considering what evidence you will collect to “know that your students have got there” lets you establish your evaluation and feedback practices. As a result, you align teaching strategies and learning activities that help your students achieve these goals. The development of understanding is core to this model. Conceptual anchors in the form of big ideas and essential questions encourage student's inquiry and meaning making and may be revisited over time in other contexts - which is why they are considered so powerful as invitations for ongoing questioning. In his compelling book, Designing Significant Learning Experiences (2003), Dee Fink outlines a course design model that incorporates the important aspects of backwards design and helps you design logical links between all the course pieces. 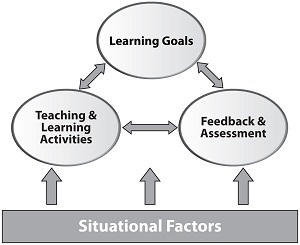 The model establishes course or learning goals, assessment practices (evaluation) and feedback and teaching and learning activities as an inter-dependent triad that can generate synergy when course activities and goals are properly integrated. The Fink model incorporates steps to help instructors consider their audience and establish appropriate course practices that promote student learning, honour institutional context, and respect instructor autonomy. Consider situational factors. Start by gathering information about the course: the number of students, pre/co-requisites, the students’ prior knowledge and experience, the nature of the course, how it fits into the curriculum or program, the nature of the subject, the culture of the discipline, and expectations of the department and institution. Identify Learning Goals. Once you understand your context then you can identify what you want the students to learn. The learning goals may be constrained by departmental and institutional expectations. Design Feedback and Assessment Activities. You first need to determine what is worth assessing. You must identify strategies to provide feedback to students to help them learn, and decide what evidence you will collect to determine whether students are achieving the course goals. Design Learning Activities. Once you have clear course goals and understand the required assessment and feedback practices you will incorporate in your course, you can then create activities and learning opportunities to help your students achieve these goals. When designing a series of course activities, it can be helpful to use Fink’s Castletop diagram. The diagram charts the sequence of in- and - out-of-class activities as you progress through the course and helps you more fully integrate all course activities. There are many resources to aid you in course design and the development of your teaching practice at UBC. You might consider attending one of the Centre for Teaching, Learning and Technology (CTLT) Course Design Intensives (3 day workshop typically offered 3 times per year), or attending some of the periodic teaching and learning workshops at CTLT, including their one week CTLT Institute in May of each year, or completing the UBC Faculty Teaching Certificate program (more information on these opportunities is available on the CTLT website at ctlt.ubc.ca. This page was last edited on 21 September 2018, at 15:25.